It was nearly as hot in Salford today as it was in Pisa on Sunday. But not too hot to enjoy a 27 km cycle ride - Bridgewater Canal > Throstle Nest Bridge > Salford Quays > Eccles > Swing Bridge > Darryl’s Fish Shop in Sale > Timperley circuit. 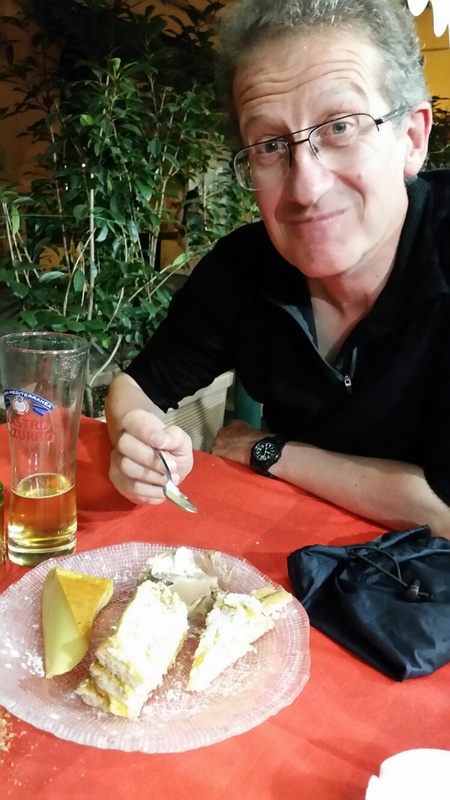 Thanks Nick – can you try to hold the camera a bit more steadily next time please? Though I do appreciate you were about to be run over! 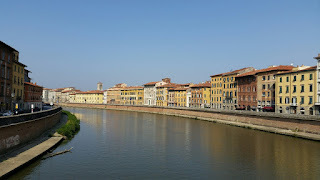 We soon realised the importance of today's date when we passed armed guards at Pisa airport. But this didn't hinder us and the day passed uneventfully. Thanks go to Penny for picking three of us up this afternoon, and to Graham for fitting our walking poles into his hold bag. It was great to see almost as much sunshine in Timperley as there was in Italy. This was a 'wind down' day after our trek, built into our itinerary to enable some flexibility for bad weather, illness, injury etc had we encountered such problems. We didn't, so we gained this bonus day in the scenic coastal scenery easily accessible from La Spezia. Hotel Mary provided an excellent breakfast, after which we took a short train ride to Riomaggiore, from where a steep path took us up to the small village of Groppo, then to Volastra for some expensive drinks and an opportunity for Cary to test the honesty of the locals by leaving his walking poles behind. The regular coastal toll path between Riomaggiore and Corniglia is currently closed due to a landslip, hence our much longer and more undulating route. The morning walk took a few hours but covered just about 8 km. Much of it was on narrow terraces between vineyards positioned on the steep slopes. A bit like Madeira's levada walking but without the water. A scenic route, but the coastal villages we could see below us would be shown in a better light in the early morning or evening. Corniglia was crowded. 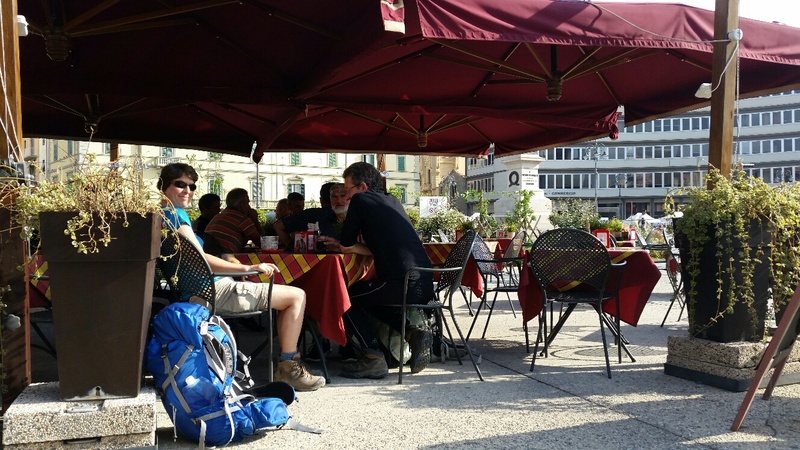 We found space to eat in a busy square, before heading off on the toll (€7.50) trail towards Monterosso al Mare. This was slow going, especially when Cary had to return to the start to reclaim his walking poles again. It was hot and crowded, if pleasantly scenic. After a while, at one of many pauses to admire the view, Cary dropped a walking pole onto a piece of land below us. Luckily he was able to find a way down through some undergrowth to recover it. He returned covered in burrs. 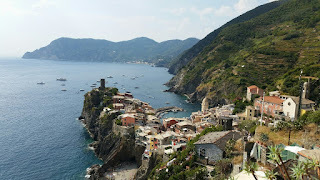 By the time we reached the pretty town of Vernazza it was 4 pm and most of us had had enough - we had walked 12 km in 7 hours with around 1200 metres of ascent. Quite enough for a wind-down day. After celebratory ice creams, Sue and Cary went for a swim, whilst Graham and I popped up the tower shown in today's top picture, taken from the descent into Vernazza. 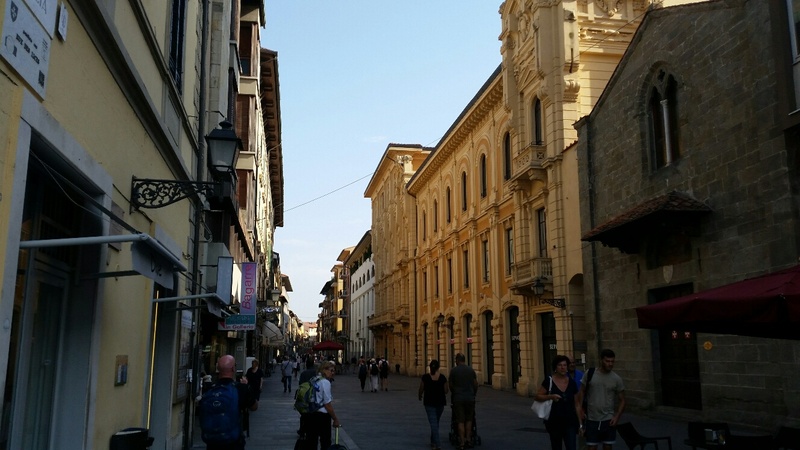 The train service soon got us back to La Spezia and the comfort of our air conditioned rooms. 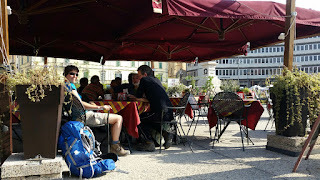 Tonight's outside table at a pizzeria was in a fine position and last night's salads were replaced by pasta and pizza. Cary, as can be seen from the lower picture, made room for a plate full of cake to round of the trip's culinary adventures.